The aim of the conference is to promote scientific debate on current regional economic, management and technology problems, strengthen international cooperation between researchers and provoke academic and business discussions in the field of sustainable development. Representatives from other countries are welcome to participate. The work in the conference will be organised in opening plenary session, parallel sessions, and concluding plenary session. Competition for the best poster will be organised and winner of the best poster will be awarded at the final plenary session. Publications of conference proceedings will also be organized. 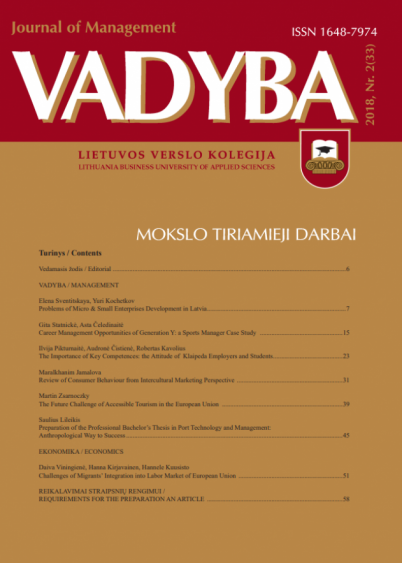 The best articles will be published in scientific Vadyba/Journal of Management (ISSN: 1648-7974, ISSN 2424-399X (online). Journal is included in the Index Copernicus, CEEOL and EBSCO international databases. All conference material will be reviewed by two reviewers before the conference. Conference languages are English, Lithuanian and Russian. The Article (see requirements and template). Scanned and signed guarantee letter (see form of guarantee letter). One review (see review form). Purpose of payment – International conference October 2019 and name, family name of participants. Information about other accommodation opportunities.